Many State Chamber members play an active role in the organization by volunteering to serve on a number of committees. These committees focus on specific areas of interest that are important to different segments of the membership. The Ambassador Committee is a specially chosen group of volunteers that assists in increasing membership and retention, and acts as a liaison between the State Chamber staff and the membership at large. For more information, contact Chuck James. The Delaware Young Professionals Network was formed to encourage young professionals in Delaware to get involved in the Chamber, networking with other young professionals and further their business growth. DYPN, for professionals between the ages of 21 and 40, aims to develop Delaware’s young workforce through professional business networking and personal growth. For more information, contact Kelly Basile. The Employer Advocacy and Education Committee promotes and assists the employment interests of Chamber members. It is a forum for members of the Chamber to discuss and evaluate human resource and personnel issues facing Delaware employers; to actively engage in the legislative process to develop and implement legislative solutions; to advise the Chamber leadership on the impact of proposed legislative and regulatory measures; and to educate the membership about regulatory requirements affecting their bottom line. The committee meets at least quarterly to identify and develop strategies for current and future issues, and holds special events open to Chamber members to focus on timely topics in the field of human resources and personnel management. For more information, contact James DeChene. The Environmental Committee works closely with the Department of Natural Resources and Environmental Control (DNREC) and is involved in the review and shaping of environmental legislation and regulation. For more information, contact James DeChene. ​The Infrastructure and Transportation Committee recognizes the critical role that the condition and functionality of Delaware's infrastructure and transportation systems play in creating a strong economy and quality of life. The Infrastructure and Transportation Committee monitors issues, policies, and trends affecting Delaware's infrastructure and transportation systems, as well as advises the Chamber's Board of Directors on related policy issues. For more information, contact James DeChene. 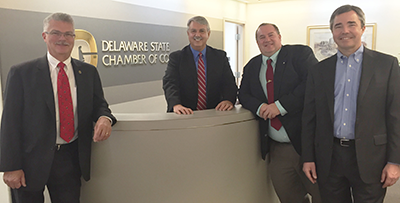 The Tax Committee reviews tax legislation and lobbies for the reduction of personal and business taxes in Delaware. For more information, contact James DeChene.